Taco Bell has tested out biscuit tacos, "Cap'n" Crunch tacos, the Doritos Locos taco, and has gone into selling alcohol at some locations. Now comes its latest creation - the Kit Kat Chocoladilla. According to a company spokesperson, the product is testing in select restaurants in Wisconsin for a limited time. 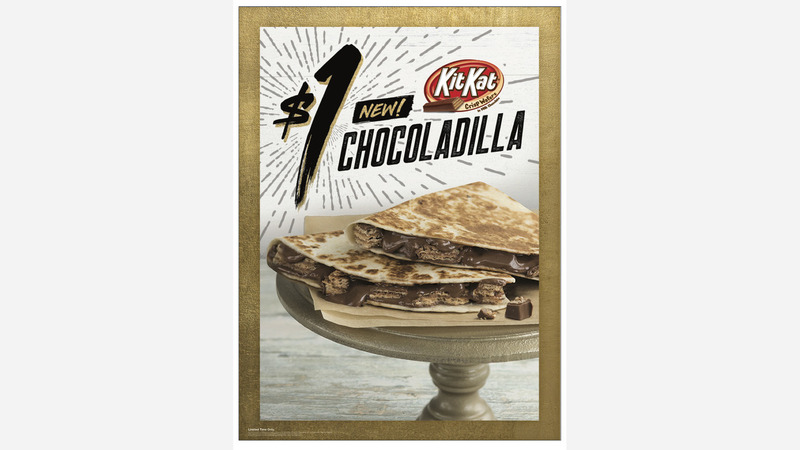 According to Fortune, the Kit Kat Chocoladilla is a chocolatey creation that packs a flour tortilla with bits of Nestlé's "nsrgy" wafer bars and melted chocolate instead of cheese or veggies. There no word on whether Taco Bell plans to roll this out to other markets in the future.